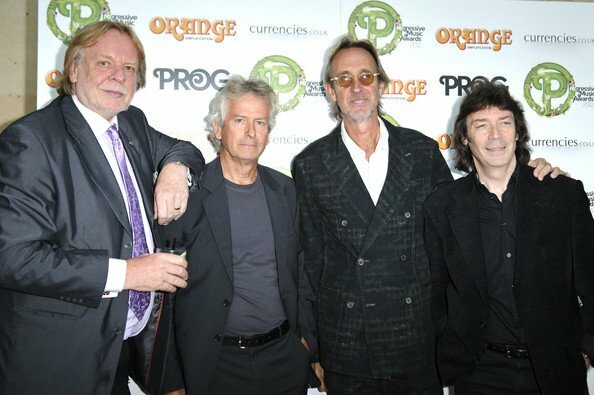 Home Tags Posts tagged with "mike rutherford"
British rock band Genesis has been honored at the first Progressive Music Awards held in London, alongside other bands including Pink Floyd and Rush. Genesis members Mike Rutherford and Tony Banks picked up the Lifetime Achievement Award at a ceremony at Kew Gardens last night (September 5). The awards, created by Prog Magazine, were hosted by presenter Gavin Esler. The inaugural event on Wednesday night brought together prog pioneers from the 1970s, and newer acts like progressive metal band TesseracT, who won a newcomer award – having released their debut album One in 2011. “All of us are massive Pink Floyd fans, so to be acknowledged by people of a similar school is quite surreal,” said TesseracT’s bass player, Amos Williams. Jerry Ewing, editor of Prog Magazine, told the audience that the music genre was “in a rude state of health”. Genesis formed at Charterhouse School in 1967 and has sold an estimated 150 million albums. Among their best-known works from the 1970s are Foxtrot, Selling England by the Pound, and The Lamb Lies Down on Broadway. The Guiding Light Award, for an inspirational musician who is “pushing the boundaries”, went to Steven Wilson, best known as founder member of Grammy-nominated British band Porcupine Tree. Steven Wilson said that bands like Radiohead and Muse had helped change negative mainstream attitudes towards progressive music. Steven Wilson, who started Porcupine Tree as a solo project in his bedroom in the late 1980s, thanked his late father for introducing him to Pink Floyd’s Dark Side of the Moon when he was a boy. Canadian rock band Rush’s latest concept album, Clockwork Angels, was named Album Of The Year. With its dystopian steampunk theme, the three-piece’s 19th studio album has earned rapturous reviews, even in the mainstream press. The Anthem Award went to the title track from Squackett’s album A Life Within A Day. The album is the work of ex-Genesis guitarist Steve Hackett and Yes bass player Chris Squire. Rick Wakeman said of his Prog God Award: “I’ve always believed that these days there is hardly a band or musician anywhere who haven’t used some element of prog in their music.